Born in New Delhi. 1989 Jury of National Exhb., Lalit Kala Akademi, New Delhi. 1990, 91, 92 Jury of Republic Day Pageants, New Delhi. 1990-2000 Collaborated with Godna tribal artist Sat Narain Pande and for the first time in India, cosigned works with him. 1991-92 Purchase Committee, National Gallery of Modern Art, New Delhi. 1992 Invited by USIS as international visitor of the year, USA. 1995 Participated in the1st Nature and Environment, international workshop, Lalit Kala Akademi, Max Mueller Bhavan and Japan Foundation, New Delhi. 1995 Commissoned by Hiroshima Museum to execute a large work for its permannt collection on the occasion of the 50th Anniversary of the Holocaust. 1995-98 Selection Committee, Republic Day Pageants for Ministry of Defence, Govt. of India, New Delhi. 2001 Advisory Committee, National Gallery of Modern Art, Lalit Kala Akademi, Sahitya Kala Parishad, New Delhi. Founder Member and Secretary General, Academy of Fine Arts and Literature. National Gallery of Modern Art, New Delhi. Chandigarh Museum, Chandigarh. Ethnografic Museum, Stockholm. Bradford Museum, Bradford. Glenbarra Art Museum, Hemeji. Victoria and Albert Museum, London. Hiroshima Museum of Modern Art, Hiroshima. Singapore Museum of Modern Art, Singapore. Deutche Bank, Mumbai and Chandigarh. Rockefeller collection, New York. Kapany Collection, San Francisco. Mohinder Tak collection, Washington. Peter and Erica Mueller collection, Munich. Jehangir Nicholson collection. Mumbai. Pheroza Godrej Collection, Mumbai. 1984 AIFACS Award, New Delhi. 1985 Received research grant for painting in Garhi Studio, from Lalit Kala Akademi, New Delhi. Commendation Certificate, Algiers Biennale. 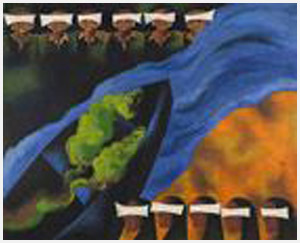 1986 Gold Medal for painting, 6th Triennale India, Lalit Kala Akademi, New Delhi. 1989 Eminent Artist, Lalit Kala Akademi, New Delhi.